Kenyon's Texan split lid grill. 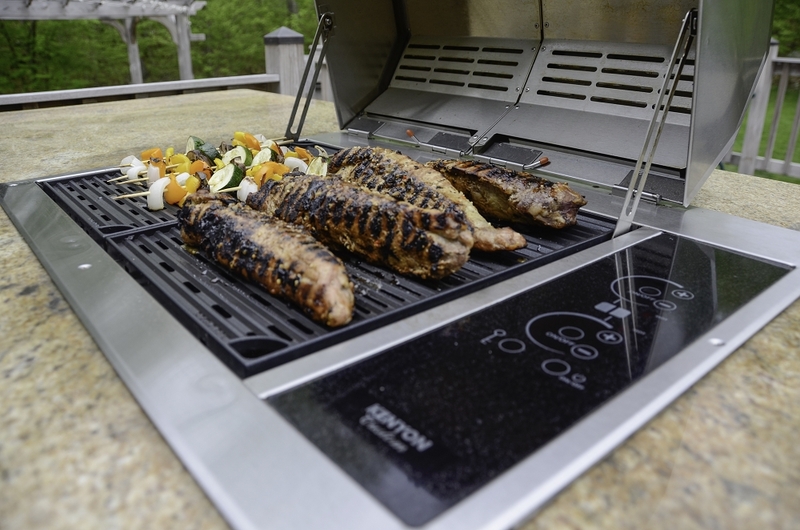 Built-in, fully electric grill has huge grilling surface with independent heat control for each grate. The Texan Grill is in a class of its own with smokeless & flameless electric cooking on 2 non-stick, split surface grill grates. The Texan. A split, double lid grill with two separate electric control grates translates to twice the grilling space and twice the utility. Available as built-in model to customize your outdoor grilling area into a custom, free-range cook-haven. Two grilling surfaces with independent heat control allow you to sear steaks on one side while gently grilling vegetables on the other. When the need arises for a flat surface simply swap out one of the grates with the optional griddle. 304 stainless steel lid helps to lock in flavor while keeping meat moist and tender. 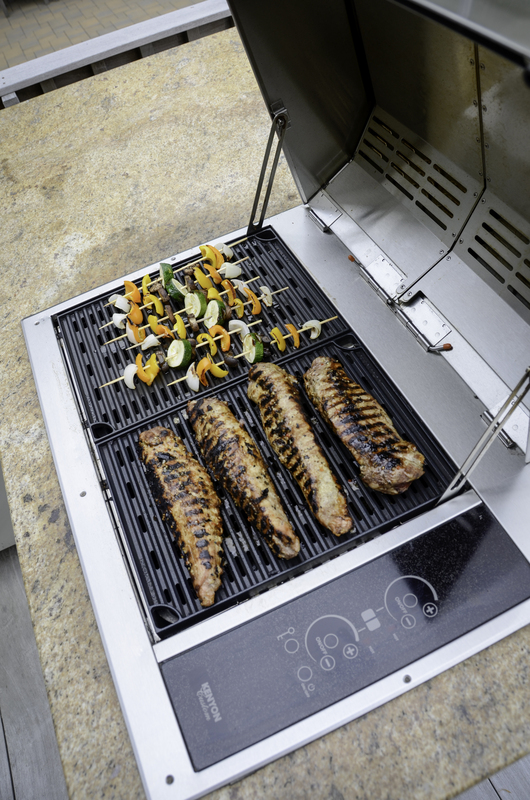 The unit contains two cast-aluminum grates that transfer heat quickly from the hidden electric element directly to the food, producing the look and taste of high quality gas grills without smoke! Engineered for quick clean up - the cast-aluminum grates are protected by a USDA-approved food-grade, non-stick coating and are easily cleaned with a damp cloth or by placing them in your dishwasher. The grease tray, a disposable aluminum pan is conveniently sourced in grocery stores or right here on SailorSams. 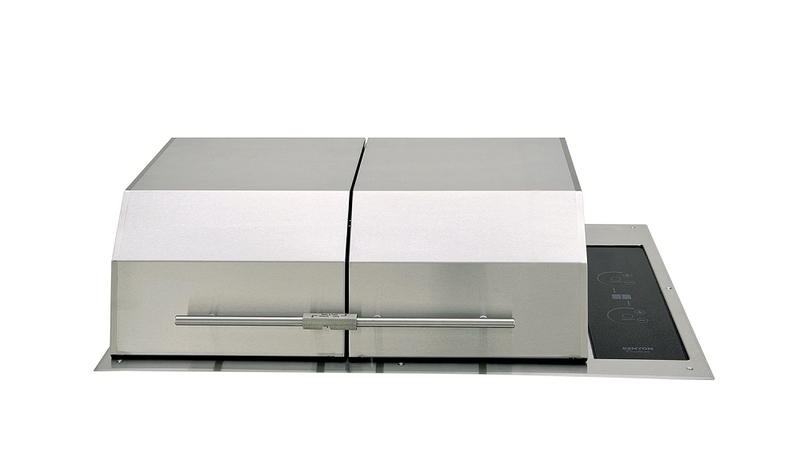 All 304 stainless steel construction electric grill with digital touch control for heat settings. Rectangular lid with rectangular flange. 310 square inches of grilling surface. Click to see the Kenyon Texan's dimensions. *This item must be shipped LTL and does not qualify for free shipping. Options include - griddle, utensil set, & replacement drip trays. Click here to check out the Texan's Sunbrella Cover! Cutout Dimensions: 28" x 18 1/2"
310 Sq. In. of grilling surface area! Grill includes a 3 year product replacement warranty. The Kenyon All Seasons Electric Grills seal in flavor and juices without the fuss of charcoal or propane cylinders. They provide a safe method of grilling without the hazard of open flames. Simply touch the On/Off circle and then raise or lower the heat setting by pressing the "+" or "-" graphic on the sealed moisture proof ceramic glass panel and you are instantly cooking. 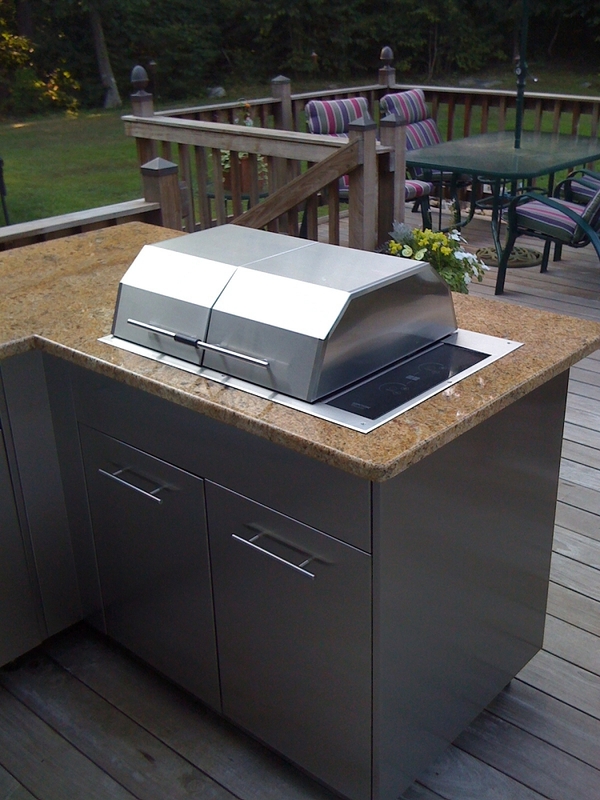 Kenyon Electric Grills are made for the outdoor/indoor residential market.